The New York Chapter of the American Fisheries Society is offering student travel awards to attend the annual meeting, February 7-9, 2018 at the Otesaga Resort Hotel in Cooperstown, NY. These awards promote student research and facilitate student interaction with the NY state fish and aquatic community. We encourage all students to apply regardless of the stage of their research. ‘Project idea talks’ are often well received. High school, undergraduate, or graduate students presenting either an oral presentation or poster are eligible. Award decisions are based on application answers, abstract clarity, and content. Awards include a $150 check and free meeting registration. Recipients are asked to attend the business meeting (Feb 8) to accept their award. The annual meeting’s theme is “Forage in the Food Web”. Keynote presentations will describe forage fish and food web dynamics in Great Lakes, inland waters, and coastal and marine waters. Presentations on any topic are welcome for the contributed sessions. 2. List one individual that works in the New York State (or surrounding) fisheries & aquatic community that you would like to talk to at the meeting and why. This should be someone you do not currently work with or study under. This person does not have to be attending the meeting and could be agency biologists, graduate students, technicians, or professors. (150 words). About the Klumb-Spindler Travel Award: The New York fisheries community lost two irreplaceable colleagues in 2013. 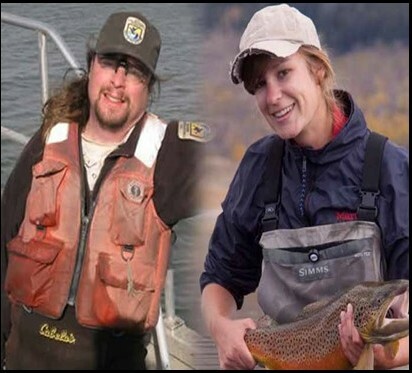 Dr. Robert Klumb, the lead research biologist for the USFWS Great Lakes Plains Office, and Maegen Spindler, a USFWS technician, had just finished a 12-hour day of fish sampling on the Missouri River when they were killed by a drunk driver. Maegen grew up in central New York and received a bachelor’s degree in Wildlife Science from SUNY-ESF while Rob, a Milwaukee Wisconsin native, received his PhD from Cornell University working on Alewife bioenergetics. Both were active in the New York Chapter and this award commemorates their dedication to fostering student involvement in fisheries.